During winter, I can’t help by keep on eating soup to warm me up… As well as creating a few new vegan recipes! 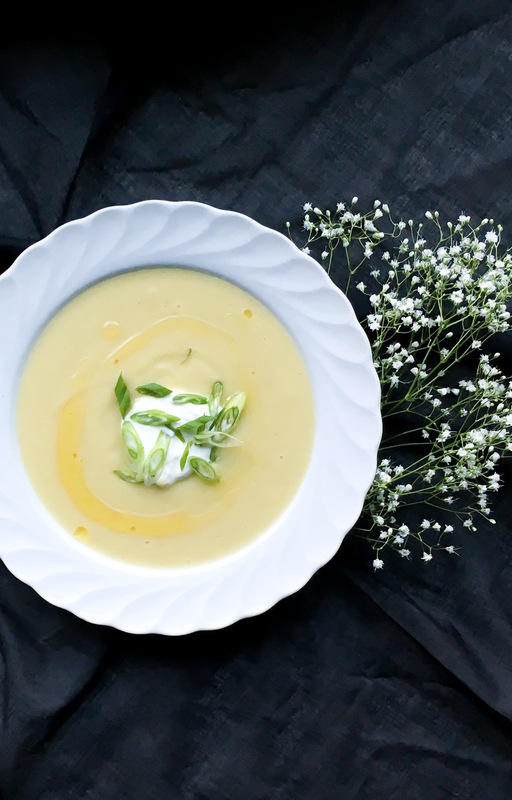 Like this parsnips, leeks, and pears vegan soup. Even though I don’t live in Quebec anymore, when it’s 7 degree Celsius outside I feel cold and therefore I need a soup!! Like now #ThisGirlIsPrettyWeakToCold Which is a great thing as this soup can be made up very quickly! In a large pot, roast the leeks in the olive oil for about 5 minutes. Add all the ingredients “FOR THE SOUP” and bring to a boil. Cook for about 20 to 25 minutes or until the parsnip and the potatoes are soft and tender. Using a high-speed blender, reduce the soup into a creamy puree. Serve warm topped with a tablespoon of yogurt, a couple green onions and a touch of olive oil.